Here is post number 3, I hope your still with me:) ! I love this paper! I found it in my stash, so there’s no telling when I bought it, or from where:( The colors just seemed too perfect for me not to use it! Your next stop on the hop is Nancey’s blog. Thanks for coming by, I hope you’ll visit the Fred She Said blog and sign up for newsletters. You’ll receive notice of the blog hops and any freebies that might be posted! 🙂 Also, stop by the FSS store, there are lots more new images that I haven’t used yet! Filed under Emma, Fall-Autumn, Fred She Said, Stampin' Up! Tagged as Autumn, Card Blog Challenges, Card Making, christmas, Digital cards, Fall, Fred She Said, Stampin' Up! Make a “Fall Leaves” themed project. Or Make a project with “Twine”. 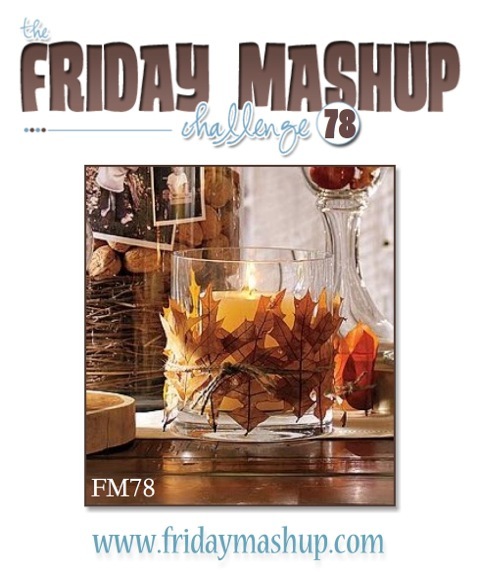 Or “Mash it Up” and create a “Fall Leaves Themed project using Twine”. Here’s what I used: my precolored digital image is from Fred She Said, it’s called Emma in the Leaves. You can also get it un colored here. I used a few colored leaf buttons that I got last year from Michaels. Everything else is Stampin’ Up! I used Early Espresso for the far back, on top of that is Cajun Craze with leaves from French Foliage. I stamped them with my VersaMark ink pad to give a nice soft look. On the left is a pretty piece from Spice Cake DSP. I got it in digital version, love it! I used my Stampin’ Up! Top Note Die to cut out my image, than added my little buttons. On Very Vanilla, I Stamped another leaf from French Foliage. I used Cajun Craze, Old Olive and More Mustard to highlight the image. I added some Twine (retired) and an Antique Brad. At the bottom I used the Autumn stamp from Season by Season (retired, I just can’t give it up). Anyway… thanks for coming by again:) If you are stopping by for the first time or rejoining after my first post tonight, I’m glad you’re here:) I have one more post tonight and it’s a Blog Hop for Fred She Said! Be sure to come back, there will be prizes! 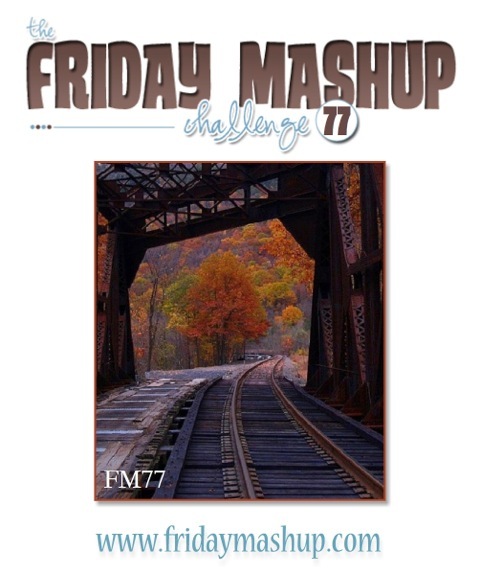 Filed under Challenges, Emma, Fall-Autumn, Fred She Said, Friday Mashup, Stampin' Up! 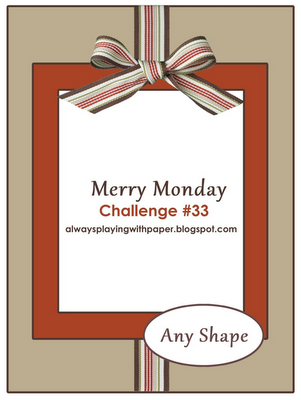 Tagged as Card Blog Challenges, Card Making, Crafts, Digital cards, Fred She Said, Stampin' Up! Nice and simple today:) There will be no supply list today, I will tell you everything I used:) First, my image is from Fred She Said, this image is called Raking. This is Emma and Rosey, so cute! The image also comes uncolored if you love to color;) I cut it out with Spellbinders-Lacey Ovals. Everything else is Stampin’ Up! 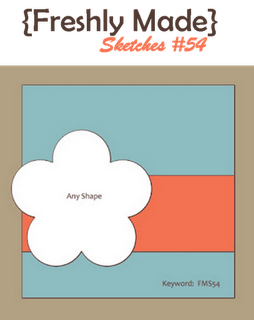 I used as my floral background a paper from Spice Cake, it’s available in digital form from Stampin’ Up! It prints up really nice on my photo project paper-matte, from Target:) I used Soft Suede (brown), Daffodil Delight (yellow), and Pumpkin Pie (yep, orange). I used some SU Bakers Twine-Early Espresso and white, and finally a Pumpkin Pie corduroy brad (retired). Thanks for coming by, I’m always glad to have company:) Be sure to stop back for two more new posts! 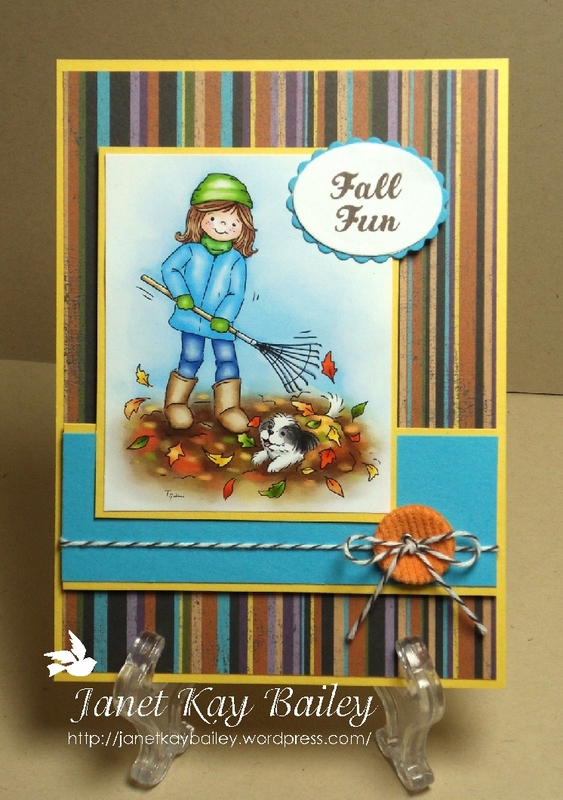 Filed under Challenges, Emma, Fall-Autumn, Fred She Said, Freshly Made, Stampin' Up! 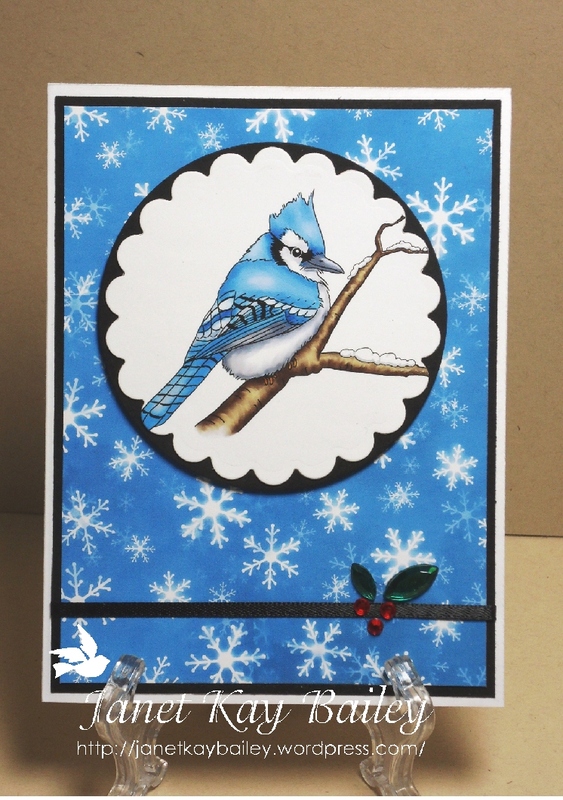 Tagged as Card Blog Challenges, Card Making, Digital cards, Fred She Said, Spellbinders, Stampin' Up! I LOVE BLUE!! I also love Blue Jays:) This is another new pre-colored digital image from Fred She Said! Tracey has been busy, and I haven’t even used some of her new images:( ! I had better get busy! This set, Blue Jay, you can get in B&W, or pre-colored. I made a card for this week, and I did mention I would show you. It’s actually on my other blog. I will put the photo here, but if you would like the instructions and/or supply list, please go here. OMGoodness, I am so late this week! It’s been a really busy week! I only have a short while to get this posted, so I will get right to it! This card is pretty straight forward, so please see my supply list below. I used a pre colored digital image from Fred She Said, called Emma the Caroler. Be sure to check out the Fred She Said Store for some new products:) Also, remember to come back Friday for the next FSS Blog Hop, there will be prizes! I am hoping to have my Freshly Made card up today, tomorrow at the latest! 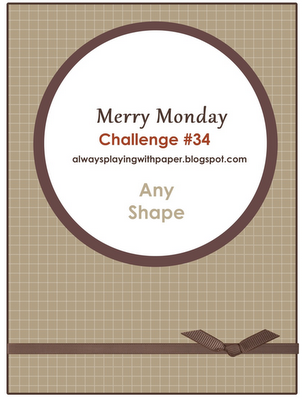 Filed under Always Playing With Paper, Challenges, Christmas, Emma, Fred She Said, Memory Box Dies, Merry Monday, Stampin' Up! Make a “Indian Summer” themed project. Or Make a project with any three colors from “Cajun Craze, More Mustard, Raspberry Ripple, Lucky Limeade & Early Espresso”. Or “Mash it Up” and create a “Indian Summer Themed project with the color combo”. For those of you who follow me, you will be shocked again! Not only did I color my apple image, I hand sponged all of my plaid! Yes, I did! I even took photos to show you! Sadly, someone else downloaded my camera and my “how to” photos got lost:( But, I will tell you what I did. I took some Very Vanilla paper from Stampin’ Up! and used my ink pads and sponges to make “lines”. I started on the right side, I used blue painters tape and pieces of card stock to block off an area to sponge. I worked my way across to the left using light sponging or more aggressive sponging. You can see some lines are darker than others, I just sponged on more color. I used Stampin’ Up! ink pads by just inking up my sponge. Starting on the right, I used More Mustard, Cajun Craze, Early Espresso, Cajun Craze, More Mustard, Cajun Craze, More Mustard. My Early Espresso looks black, but it’s actually a very dark brown. I used Early Espresso to make my lines. I used Lucky Limeade behind the apple and for the cellophane covering the apple. I used Raspberry Ripple for the far back, background paper, and for the apple. For the stick I used More Mustard, very lightly. For the whole apple image, I used my Aqua Painter and just stamped some ink onto my glass worktop, then picked it up with my Aqua Painter. The leaf gems I bought at Michaels about a year ago, but I saw some recently in the $1.50 bins. 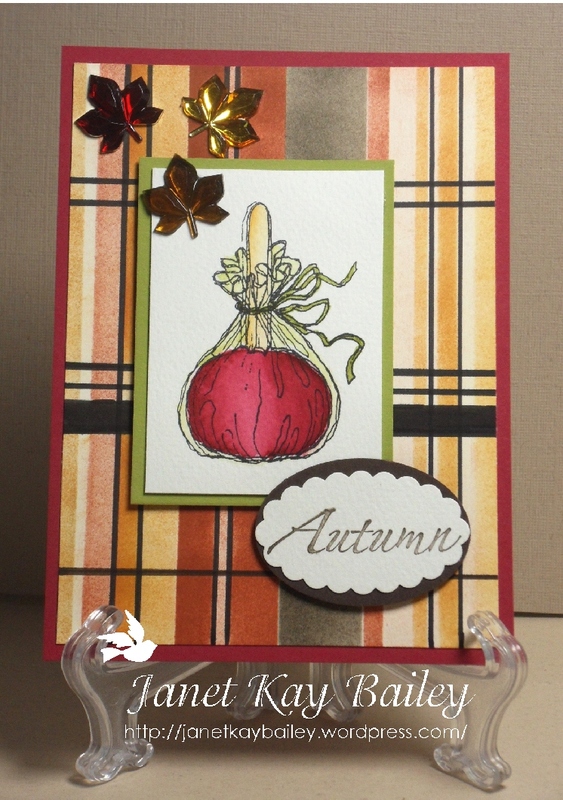 Filed under Challenges, Fall-Autumn, Friday Mashup, Stampin' Up! 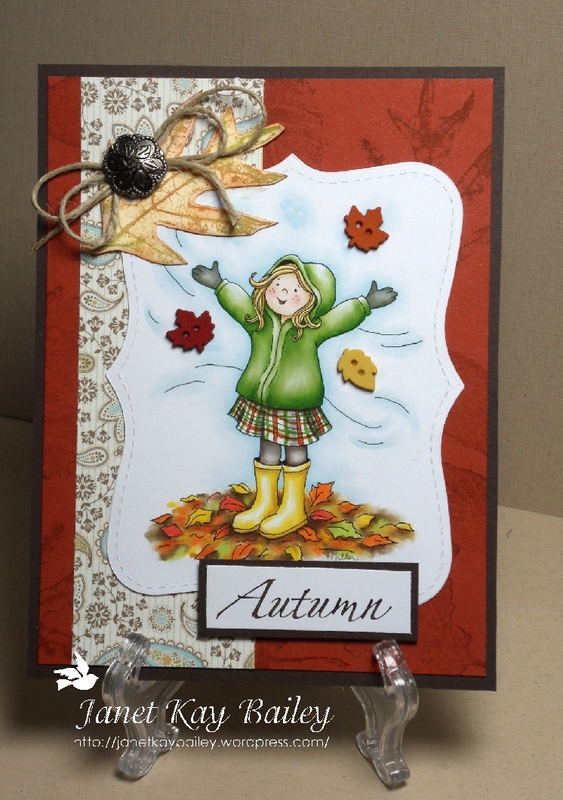 Tagged as Autumn, Card Blog Challenges, Card Making, Crafts, Fall, Stampin' Up!